It all started when I moved full time to Tahoe and got involved with the Donner Party Mountain Runners. I was meeting a lot of rad people and would hear the mention of people I should meet. Betsy Nye was one of them. My introduction to Betsy was based on a mutual love for the hard tall Colorado mountains. I was looking for a partner for Nolan’s 14 and she was a crusher 14 time Hardrock 100 finisher. We chatted about the prospects of teaming up together on Nolan’s, and I offered to pace her in exchange on her 15th Hardrock 100. As the summer approached and Betsy’s injuries lingered we both agreed Nolan’s wasn’t in the cards for her this year and she had already got all her pacing shifts covered. I drove out to Colorado at the end of June to start my training for the summer. I already found a new Nolan’s partner and promised Betsy I’d cheer her on at the Hardrock. On Tuesday three days before the start of the Hardrock 100 I got a call from Betsy. One of her pacers was injured and she was looking for a sub in. Conveniently I was super available and excited to help out. I had been battling a pain in my gums for three days, but I didn’t think anything of it. That night after agreeing to pace Betsy it hit me. I was up all night moaning and crying in pain. I tossed and turned crying and screaming for help. As the sun rose restless and in excruciating pain I walked three miles to the dentist tears streaming down my face unable to control the internal moaning of pain. I begged the dentist to see me immediately. They quickly got me in and sent me immediately to an oral surgeon. I had let a gum infection spread to my jaw. The oral surgeon who was booked till September, fit me in as an emergency and pulled a tooth to release some pain. I was also put on an antibiotic to hopefully kill the raging infection. This was Wednesday and the Hardrock was on Friday… I couldn’t let Betsy down. I was pacing her those 17 miles infection or not. The narcotics actually helped me sleep at night but the infection didn’t seem to subside even after a few days. Laying in my van the day before the hard rock I felt nervous about pacing Betsy. It was about her and if I struggled that wasn’t okay. I kept telling myself that it was suffer training. That if I could run 17 miles with a fresh hole in my mouth and an infected gum I could run any distance. I had been on a liquid diet for about 4 days and was living off of baby food. I could feel the hollow in my stomach. I was finding it impossible to get enough calories. Betsy started that morning at 6am and at 7pm I was sitting in downtown Ouray watching her tracker and anticipating her arrival. She’d be about 43 miles into the 100 and I would be taking her to mile 60. When she arrived we tried to get her in and out of the aid station as fast as possible. With only a few hiccups Betsy and I were walking our way to Box Canyon. This was my first time ever in Ouray not in the winter and I couldn’t help but remember all of the fantastic ice climbing trips I had taken to this canyon. As we moved along she asked about my mouth and I responded that it was best if we didn’t talk about it. The taste of blood was already strong in my mouth and I was fearful about the night ahead. Betsy was moving at a really good pace and I kept up right behind her talking about this and that and everything in between. As the sun set we became silent and tried to focus on the trail ahead of us. Though it was dark you could feel the great exposure opening up beside us. Betsy, behind me at this point, commented on the fact that if you trip and fall you die. I didn’t feel afraid. Heights and exposure don’t scare me… maybe it’s from my years of rock climbing. As we got higher, the night got darker, and the air got colder. We had run through several creeks at this point and I could feel the deep sinking feeling of coldness soaking in. Betsy didn’t want to stop till we got to the aid station so I rotated which hand was holding the flash light and which was in my pants. When we finally reached engineering pass I was ready for a few extra layers. We sat by the fire for a bit trying to dry out our feet and get moving. The next section was very steep up hill. We kept moving because after cresting over the summit it would be all down hill to the aid station where Angela would take over pacing. Once we started to go downhill Betsy just took off. For over 50 miles on her legs she was moving quick and efficiently. I jogged along beside her feeling the swollen right side of my face jolt up and down with every step. I had come to the conclusion that I wasn’t feeling any pain because my brain was trained to block out pain when I was running… unlike when I sleep and the pain can only be subsided with narcotics. 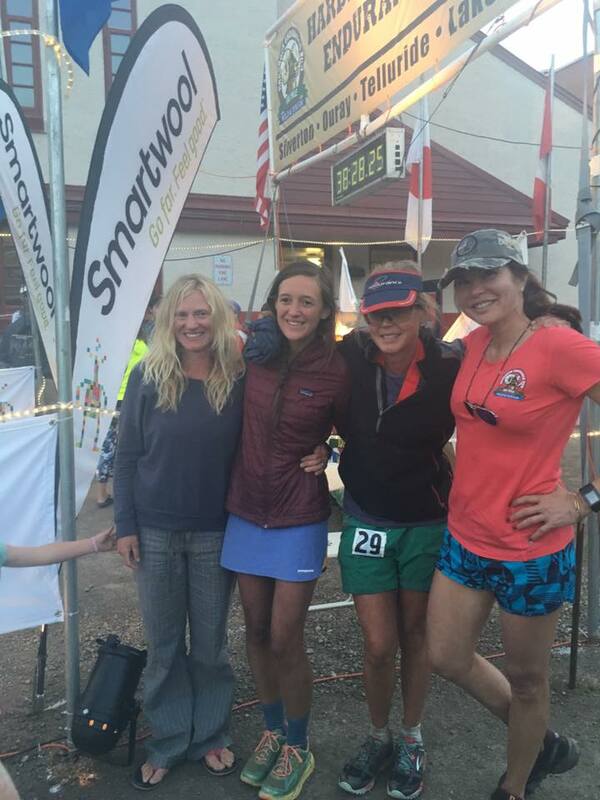 We made fast work of the downhill and showed up at the aid station greeted by her friends and family at 2am. We got Betsy all fixed up and headed towards Handsies. I was feeling happy to be done and head to bed with my dog. I caught a ride with Betsy’s dad and was asleep in my van by 3:30am. We woke early the next morning and I joined in on the crew for Betsy. We met her at the last aid station and got her ready for the finally push to the finish. As the sun just barely began to set Betsy came running into downtown Silverton and kissed the rock for her 15th Hardrock 100 finish! It was such an amazing experience to get to witness and be a part of! The next day we got to join in on congratulating all of the finishers and all of the people who didn’t finish in a family style ceremony. It made me really appreciate races that aren’t over run by sponsors and money. It reminded me of all the great people I met in Alaska and the way it felt like a family. As I finally said my goodbyes my heart felt warm and heavy and my face still very infected. I spent the next week going into my second mouth surgery and planning my next snow 100 miler. So thankful for all the people I met and all the time spent in the mountains!